Dimensions 0.75 by 5.50 by 6.25 in. Amazon.com description: Product Description: Where did the universe come from? What was there before it? What will the future bring? And finally, why is there something rather than nothing? Lawrence Krauss' provocative answers to these and other timeless questions in a wildly popular lecture now on YouTube have attracted almost a million viewers. The last of these questions in particular has been at the center of religious and philosophical debates about the existence of God, and it's the supposed counterargument to anyone who questions the need for God. Scientists have, however, historically focused on other, more pressing issues--such as figuring out how the universe actually functions, which can ultimately help us to improve the quality of our lives. Now, in a cosmological story that rivets as it enlightens, pioneering theoretical physicist Lawrence Krauss explains the groundbreaking new scientific advances that turn the most basic philosophical questions on their head. One of the few prominent scientists today to have actively crossed the chasm between science and popular culture, Krauss reveals that modern science is addressing the question of why there is something rather than nothing, with surprising and fascinating results. 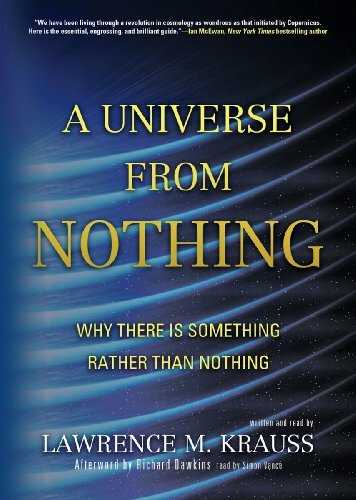 The staggeringly beautiful experimental observations and mind-bending new theories are all described accessibly in A Universe from Nothing, and they suggest that not only can something arise from nothing, something will always arise from nothing. With his characteristic wry humor and wonderfully clear explanations, Krauss takes us back to the beginning of the beginning, presenting the most recent evidence for how our universe evolved--and the implications for how it's going to end. It will provoke, challenge, and delight readers as it looks at the most basic underpinnings of existence in a whole new way. And this knowledge that our universe will be quite different in the future from today has profound consequences and directly affects how we live in the present. As Richard Dawkins has described it, this could potentially be the most important scientific book with implications for supernaturalism since Darwin.